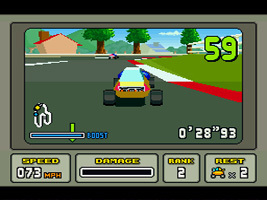 A 3D circuit racing game that uses the Super FX chip to create its tracks and cartoon vehicles. Each of the vehicles has different handling, top speed and damage statistics. Race around the circuits, passing the checkpoints in time and crossing the line in first place to move on to the next track. Your car's damage meter increases if you collide with obstacles or other cars. If you take too much damage, the car falls apart and you forfeit the race, losing one of your lives. You	only get a limited number of lives per cup. A training track where you can get used to the handling of the car. This mode is replaced by Free Trax after clearing Speed Trax mode. Choose between two cups, each with four racing circuits and a bonus track. Clear the laps within the time limit. You get different scores for the position you place, and these are tallied to determine the winner of the cup. In the bonus tracks you play the Trailer, and can earn extra lives. Race through stunt courses, collecting all the stars aiming for a perfect score. 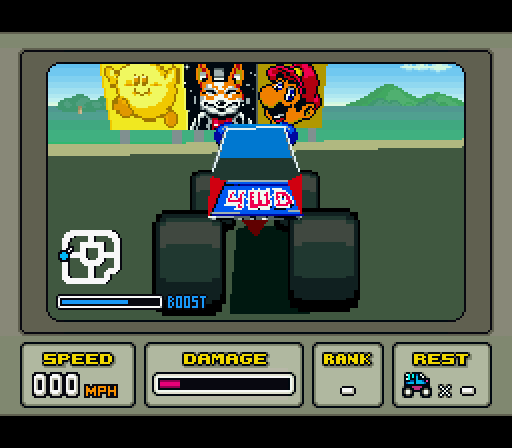 A one-on-one race that can be played against a computer or human opponent. There are four exclusive tracks to this mode. Race alone on any of the tracks you have cleared in Speed Trax mode and try to beat your best times. A small, yellow car with a middling top speed and low grip on the road. In Japan, Coupe is referred to as a female. A formula-one car with a high top speed and good handling. F-Type has the weakest resistance to damage of all the cars. A monster truck with low top speed, but good off-road abilities and superior damage resistance. A motorcycle you can unlock in Free Trax by clearing Novice cup in Speed Trax, or for all modes by clearing Master cup. It has a top speed as high as F-Type, and good damage resistance, but is difficult to control, especially around corners. 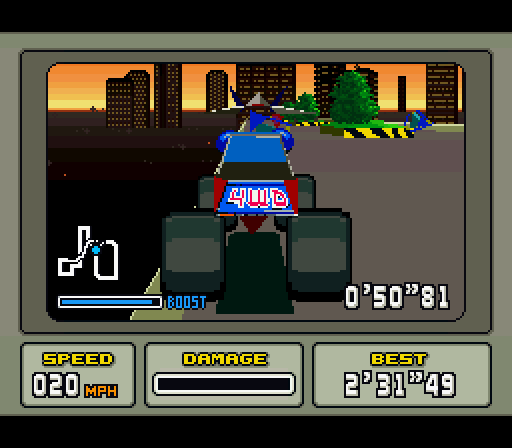 Used exclusively in the Bonus Mode of Speed Trax, the trailer is a truck that is difficult to control but impossible to damage. A Nintendo logo banner also appears during the game, and small Mario and Luigi icons appear in the arena. Star Fox was the first Super FX game, and Stunt Race FX the second, and both games were jointly developed by Nintendo and Argonaut. As a result, the Arwings from Star Fox make a number of appearances. On the Night Cruise track there are several advertising banners for Star Fox. If you touch the walls under the first three then they fall down, and as you turn towards the tunnel, an Arwings flies down and drops an item. 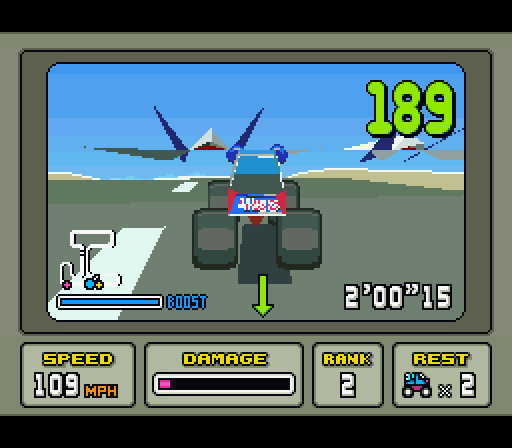 On the Sky Ramp track, three Arwings fly above the stage in formation, performing tricks. They appear twice per lap, each time in a different place.